The Lights are ON and Everyone is Home! I recently purchased a few rolls of those 12 volt DC flexible light strips from the Chinese website wish.com. 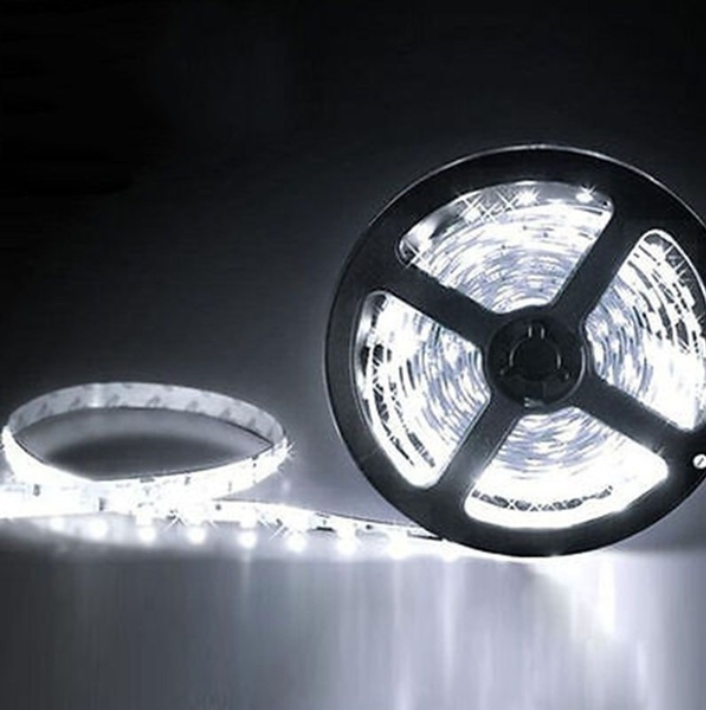 These LED strips have a flexible back tape and are about 5meters long. They come in several colors and cost around five dollars including snail mail shipment from China. The lights on the string are very bright and have many potential uses for decorative or serious custom lighting. The individual lamps can be cut away into multiple strips and configured around corners or different angles to suit your project, as long as you solder the 12 volt leads to power your arrangement. Let the FUN begin! My first custom project with these LEDs was to make a trouble light on a stick , or a bar lamp that would light a countertop. It was not important to make a full case to mount it, I just was curious how bright these things are. To power the strip, I located a 12 volt “wall wart” power supply from an old laptop computer. I powered the strip which was still on the reel it was stored on to verify it lighted up, and WOW! Beautiful bright whit lights ( Warning, do not stare at the beautiful bright lights, you will see them for another half hour even with eyes closed). I had a lot of 1 inch PVC on hand, so I wrapped the lights around the outside of the 18 inch section I had cut. The backing tape was awkward, but 5 minutes later I had a full tube of LEDs ready to power. The result was as good as any light you may purchase in a much neater package at a retail store…..but for only 5 bucks! To make a portable light, I was curious if a 9volt battery would work….. nope. I connected 2 in series for 18 volts and hoped the light would not burn out. Success! 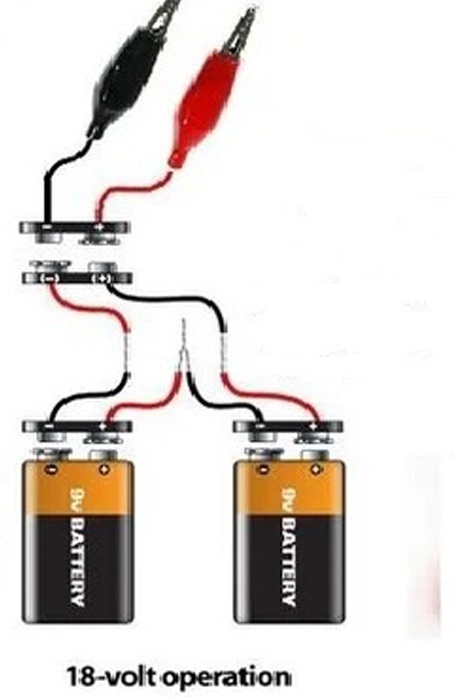 There is a downside, battery power is limited, I later found that 2 strings will use about an amp of power, so a large battery is needed, although it is a thing of bright beauty with 2- 9 volt batteries, but they get warm indicating a short battery life. Did you ever think of how many batteries there are present in your everyday life? It may surprise you that literally everyone has one or more batteries playing an essential role our daily routine. It might be a fun, if not totally ridiculous exercise to actually reflect on how many of these portable micro-kilowatt devices we depend on today and everyday to power our modern world. Ask yourself if you have used, or will use any of these devices today, all powered by a battery of some shape or size. Here are some that come to mind, you probably have even more! All of these products may need to be plugged in for a while because within the device, is a wonder of the modern world…..a rechargeable battery. 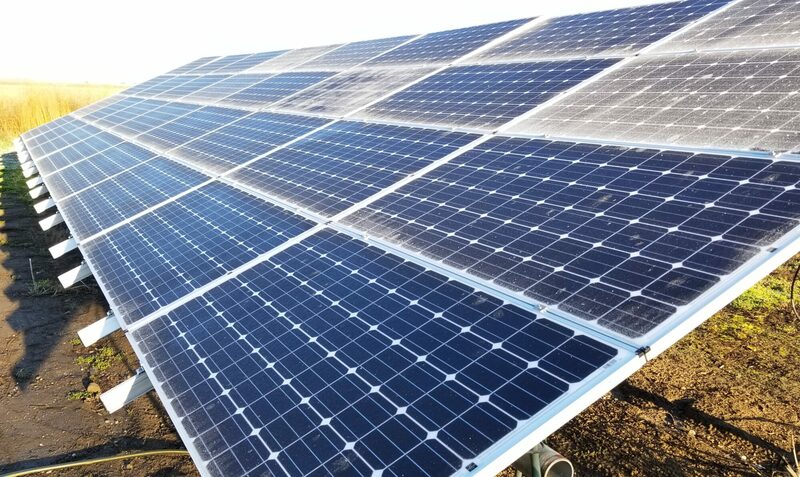 Homewatts.com is a website dedicated to exploring the ever changing world of products that can improve our life and save us money, all while learning a little more about those things that consume power….aka WATTS. More about electricity later. Rest assured, this is a site where COMMON SENSE is spoken.